ipcress titles from russelldavies on Vimeo. It's all there isn't it? The pyjamas, the kitchen, the specs. He starts the day with grinding coffee and checking the racing form in the paper. (And we all know that he shouldn't press his coffee so soon, but we've got to get on with the film haven't we?) He doesn't even seem to bother with a shower, that unhealthy obsession with cleanliness not seeming to have crossed the Atlantic yet. Palmer wins (and gets the girls) because he knows about food. Bond is a fussy little snob so he carefully specifies what he eats (eggs from French Marans hens, Tiptree marmalade, Norwegian Heather Honey) but it's almost always clubbable comfort food. Nothing with brio. And seemingly nothing he's ever cooked himself. So to be Bond you have to be wealthy, to be Palmer you just have to learn to cook. 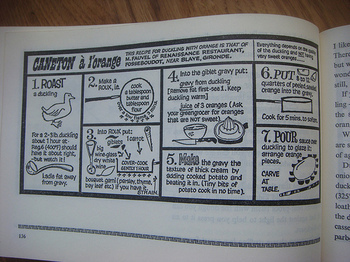 Of course Palmer's love of food comes from Mr Deighton himself, who trained as a graphic designer and did these cookstrips for The Observer. (Also featured in Ou Est Le Garlic). And AceJet tells us that Mr Deighton features in The Ipcress File as the hand cracking the egg, because Michael Caine couldn't do it in the impressively single-handed way the script and the seduction demanded. 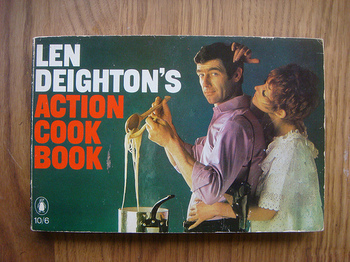 "I am going to cook you the best meal you have ever tasted in your life..."
Interestingly, the hero of the early Len Deighton books was apparently from the North of England rather than the cockney Harry Palmer of the films, but it's hard not to think of Michael Caine when reading the books. Great to see this sequence again. Amazing. Thanks. One of my favourite films! A corker. I have the OST on vinyl, thanks to my friend Steve. Features a cymbalum you know.